Being hesitant, inhibited, or untalkative in certain social situations. Coming across as meek and soft-spoken. Avoiding certain social situations, either entirely or by being in them but not fully participating. Being less likely to take social risks. This could be for small actions, like speaking up to tell an edgy joke in a group of friends, or something bigger, like asking someone out. On occasion, being extra talkative or outgoing (this happens due to nerves, or because the shy person feels they have to act this way because that's what other people expect). Worrying about how you come across to others or what they'll think of you. Feeling that everyone is observing and evaluating how well you do socially. Feeling tongue-tied or worrying that you won't know what to say. Feeling that being rejected would be a horrible experience that you couldn't handle. Symptoms of anxiety such as trembling, sweating, an upset stomach, or a racing heart. Physical signs of anxiety or embarrassment you don't want people to notice, such as blushing, sweaty palms, or a tight, constricted voice. People who are confident and charismatic across the board, but they feel 'shy' in the sense that if they do something like walk into a room full of strangers, they may feel out of their element for a minute or two before they dive in and start working the crowd. People who have it together on the surface, but they're inwardly self-conscious and hesitant at times. They say they feel shy, but it doesn't have much of a practical effect on their lives. People who do fine in most social situations, but feel ill at ease in a few of them. For example, they may get really nervous and self-conscious at parties, or networking events, but be fine around their good friends and co-workers. People who are shy all around, though not to an extreme degree. Certain scenarios give them the most trouble, but even day to day they're a bit more tongue-tied and uncomfortable around others than average. They have more social insecurities as well. On the whole their shyness doesn't get too in the way of their functioning. It's more of an inconvenience. People who act very shy in most social situations, are buried under a mountain of worries, and whose lives are noticeably worse off because of it. If their shyness is severe enough it may even be more appropriate to describe them as having Social Anxiety Disorder / Social Phobia. Shyness is one of those conditions that has been studied enough by this point that mental health professionals have a fairly good handle on how to treat it. That's not to say the ideas below will cure someone overnight. Many of them take time and effort, but they've been shown to be effective with many people. The points below won't go into exhaustive detail. There are entire books that do that. What they'll do is give a brief overview of the general approaches to overcoming shyness, and link to some other articles that are more thorough. Some people want every trace of their shyness eliminated. Others see their shyness more as part of their personality and don't necessarily want to totally get rid of it. They may realize they're quiet or inhibited sometimes, but are comfortable with that side of themselves. They may want to be able to handle certain situations better, but have no need to change the fact that, say, they're not total social butterflies at house parties. If you're in the second camp, it can help to take the time to think about what facets of your shyness you want to work on and which ones you're fine to leave as is. It can also be useful to realize and accept that it's okay to remain shy in some ways. As I love to mention all over this site, I wrote an article about how there's no quick, effortless way to fix your social issues. Everything in it totally applies to trying to get over shyness. People especially tend to look for magic bullet solutions for problems that involve anxiety and fear of rejection, and shyness definitely fits that bill. Facing these things the proper way (i.e., head on) is hard after all. A ton of advice on shyness falls into this category. Shy people have all kinds of worries and insecurities. These fears are often exaggerated or distorted, but shy people act as if they're realistic, and this prevents them from getting involved in more social situations. If they can get a handle on these thoughts they can become more comfortable around people. Some approaches are about going after negative thoughts directly. Another angle is to try to boost your sense of self-confidence or self-worth. The idea here is that if a person feels good about themselves, that will help override any negative or insecure thinking they may have. A fair amount of the shyness advice you'll come across falls into this category. Any time you read something that seems like it's trying to motivate, inspire, or lift you up, I'd say it's following this strategy. For example, an article may tell you how unique and special you are as an individual, shyness and all. This is probably the most effective way to overcome shyness in the long term. If certain situations make you feel shy, put yourself in them until you're used to them, and you learn how to act more effectively in them. This is a long, sometimes hard, process. Facing your fears is uncomfortable. So is making mistakes and learning from them. Ditto for occasionally getting rejected and learning firsthand that you can handle it. This point won't apply to everyone. Some people who are shy have perfectly good social skills. Their problem is that their shyness and anxiety prevents those adequate skills from coming out. When they're not feeling too shy they do just fine in interpersonal situations. Others have underdeveloped people skills in addition to their shyness. On top of learning to handle their inhibited/anxious/insecure symptoms, they could also benefit from learning things such as better ways to make conversation or how to mingle at a party. They'd then need to put in the time to practice and develop those new skills. Though sometimes just knowing how to handle a social situation can make someone feel more confident in tackling it. 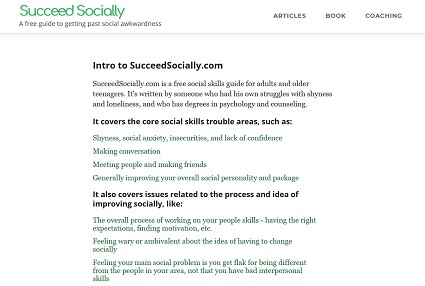 Of course, this site is full of advice on all kinds of social skills topics. 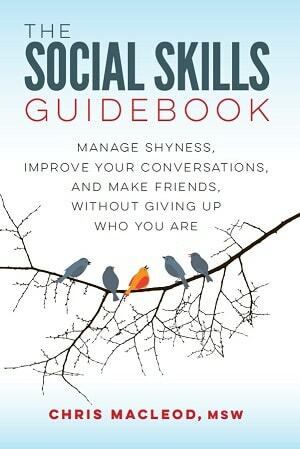 If someone is shy and they have weaker social skills, it will probably take them longer to get over their problems. They have to work on two things at once, and they feed into and exacerbate each other. With time and practice they can be overcome. The hardest part is usually at the beginning, before things start to click into place.